F's ankle was not as bad as we'd feared. We got elastic wrap to stabilize it and iced it, then planned a quiet day around my doing two loads of laundry. Fun. 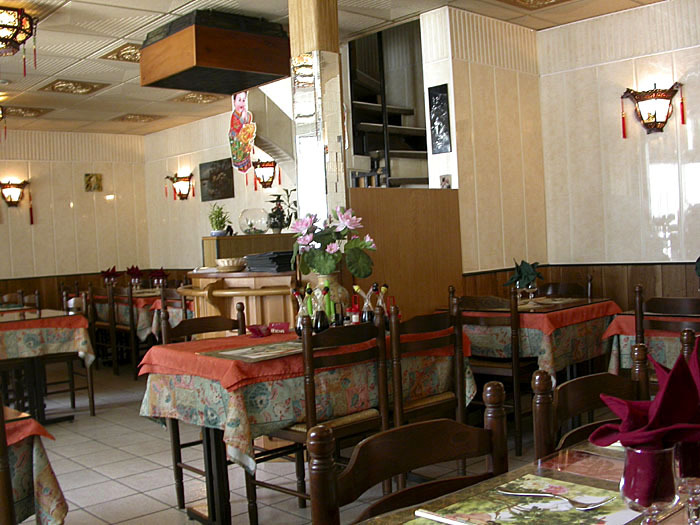 We'd seen a Vietnamese restaurant in Pontivy on Thursday's ill-fated drive, and, since I have Viet lunch at least 5 days a week in Maine, I wanted that little touch of the familiar. The lunch was fine, and F's ankle was not turning blue, so things were looking up. We got creative about dinner plans, stopping for big thick pork chops. F wanted to use a damp-wood-chip method to add wood-smoke flavor to our gas barbecue. I cut chips from the firewood bin, soaked them for hours, wrapped them in foil, punched holes for fire and heat, and the chops came out spectacularly good. We'd independently come to the idea, also, of making a chutney from the big bowl of cherries that our hosts had put out for our arrival, and so our dinner was assured with more duck-fat potatoes, pork with cherry chutney, cold leftover artichoke with excellent French mayonnaise, slim haricots verts, and, of course, Muscadet and dry cider. F had sneaked a chocolate éclair into her boulangerie purchases, as well, so the day was salvaged by great food.